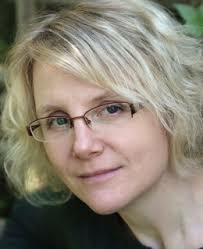 Welcome to today's interview and giveaway with Sally Malcolm! 1. Who is Sally Malcolm? Hello! Thanks for having me on your blog today. Who am I? Basically I’m a huge geek. I’m a fan of sci-fi and history (not as different as you might think), and I love to write about both. I live in London with my husband and two children, and am lucky enough to split my writing time between romantic fiction and licensed novels based on the sci-fi TV shows Stargate SG-1 and Stargate Atlantis. I write at a small desk in my bedroom, crammed between the wardrobe, the window, and a chest of drawer s. Its cosy, but I like it. When I’m not writing, I love dragging the kids to museums and castles, or going along to sci-fi conventions to geek out with fellow Stargate fans and readers of my books. Sometimes I even do a panel discussion or Q&A session - even though I find them totally terrifying! 2. Tell me about your new book, The legend of the Gypsy hawk? I’d love to; I had so much fun writing it! 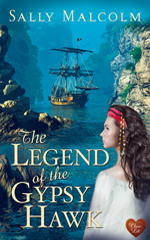 The Legend of the Gypsy Hawk is a fast-paced romantic adventure set in the golden age of piracy – think Pirates of the Caribean for grown ups. No skeletons or ghosts, but a wily and seductive pirate captain and a fierce, determined heroine who will do whatever it takes to protect her people. When Captain Zach Hazard returns to the pirate colony of Ile Sainte Anne, to warn them about the gathering clouds of war, he doesn’t count on falling under the spell of Amelia Dauphin, the beautiful daughter of the island’s leader. Captivated by her adventuresome spirit, Zach finds it impossible to leave Amelia to the fate she’s chosen – even when his rival, the privateer captain, Luc Géroux, appears to have claimed her for his own. As the crisis overtakes them, Zach finds himself at the eye of the storm. And then Amelia makes a choice that tears everything apart and Zach must decide whether his love for her will destroy him – or redeem them both in the end. The short answer is Zach. I love heroes with unexpected shadows, the ones who appear to be all glitter and gold on the surface but who, deep down, hide passions, doubts and hurt that only the heroine can uncover. The character of Zach Hazard came to me almost fully formed and I fell in love with him right away. So the inspiration for the book was to tell Zach’s story, to peel back the layers of his complex personality. To do that, I needed to put him in an impossible position – enter Amelia, stage left. Zach’s powerful feelings for Amelia, feelings he can’t overcome, challenge everything he believes about himself and the world. They put him in a place where he’s forced to confront the extravagant persona he’s adopted, where he has to decide what it is he really wants and values, and, ultimately, where he has to decide what it means to be a good man. I love the sea. It makes me feel alive in a way nothing else does and I could sit on a beach or a clifftop watching the waves forever. But I’d make a terrible pirate, not least because I get horribly seasick! I can’t even sit on a garden swing without feeling queezy. And I’m not too fond of grog or weevils in my ship’s biscuits either. I definitely prefer a cup of tea and a chocolate digestive. But that’s the great thing about being a writer; I can play at being a pirate from my comfy corner behind the wardrobe. Avast! 5. Are you working on something right now? Yes, I’m currently working on a couple of projects. I’ve almost finished the first draft of my latest Stargate novel, which I’m working on with my writing partner Laura Harper. It’s called Stargate SG-1: Exile and is the second in the Stargate SG-1 Apocalypse trilogy. It’s due out in summer 2015. In terms of romantic fiction, I’m working on a new historical novel called The Thief Taker, about a streetwise heroine called Lena Hartstone. After her brother’s murder, Lena works as a thief taker under the patronage of the Dowager Duchess Lady Stowbridge, tracking down highwaymen and bringing them to justice. But to unmask the most notorious highwayman of all, the man she blames for her brother’s death, Lena will have to enter a dangerous and unknown world – London’s high society. Thanks so much for having me on your blog today; it was fun answering your questions! 3. Comment and you are in. To Amelia Dauphin, freedom is her most prized possession and she will stop at nothing to keep it. Daughter of a Pirate King and the youngest captain in her father’s fleet, she lives on the island of Ile Saint Anne, where pirates roam free and liberty reigns. Zachary Hazard, captain of the Gypsy Hawk, hasn’t been seen on Ile Saint Anne for six years but his reputation precedes him. To Zach, liberty is the open water and he has little time for the land-bound pirate island. A swashbuckling pirate adventure. Pirates of the Caribbean for adults with a sizzling romance at the heart! Set among the freebooting pirates of the early eighteenth century, The Legend of the Gypsy Hawk is a tale of romance and adventure, but ultimately it’s a story of love and its power to redeem even the most broken of souls. It moves from the exotic shores of Ile Sainte Anne to the frozen streets of a London winter and at its heart lies one question: how much would you sacrifice for duty? Your life, your freedom – or the one you love? I would make a crappy pirate...bc I am lazy sometimes and a rough life is not a life for me. Now a gyspsy? Or a rogue on land that does not involve sinking? Yes. "The short answer is Zach. I love heroes with unexpected shadows, the ones who appear to be all glitter and gold on the surface but who, deep down, hide passions, doubts and hurt that only the heroine can uncover." ME TOO!!!! I'm a little in love with Zach already:) Can't wait to meet him! Thanks so much for having me on your blog today. I'm glad to know you're a Stargate fan too. :) Let me know if you'd like to get hold of any Stargate books! Fantastic! It's such a great show. We've published fifty titles now - including an 8 book series that continues where S5 of SGA ended. Sounds like a cool swashbuckling adventure!! I would also be a terrible pirate! I get seasick too. This sounds awesome, thanks for sharing! i would love this. I am always up for an exciting pirate adventure. I laugh that she gets seasick on a swing. Oh it's nice, I haven't really read a fantasy pirate book but it sounds so much fun! thanks for the discovery and the interview! I love to watch pirates & read about them, but it would have been a terrible life. Totally agree - pirates are best on screen or in books. The reality would have been a very hard, short life. Most of the famous pirates were dead before they reached 30! Thanks so much for your comment. Good luck in the giveaway! *waves back* Thanks for reading my post!